Another tourist landmark that we visited was a traditional Chinese Temple, which is surrounded by buildings situated in a park-like setting. The temple, majority of us knows is primarily a place of worship, sanctuaries for the gods and the very core of local communities. 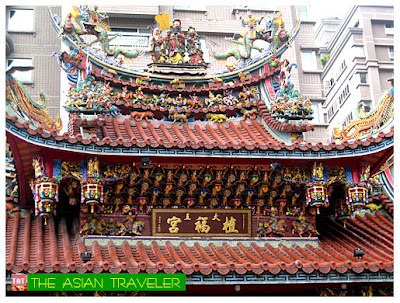 These Chinese temples are to be seen everywhere in Taipei and some are noted for its long history and refined artistry. 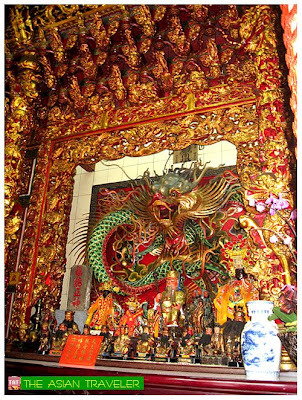 It is said that locals continue worshiping a variety of Buddhist, Taoist, and folk deities in a single temple. 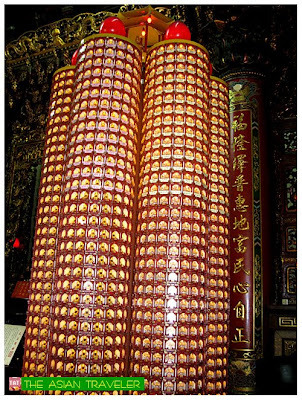 Since we have visited several Chinese temples in Asia, I was looking forward for a grand and majestic one. However, it was noticeable that the temple is quite small, just a one-story detached unit. It has no main gate, halls and archways. 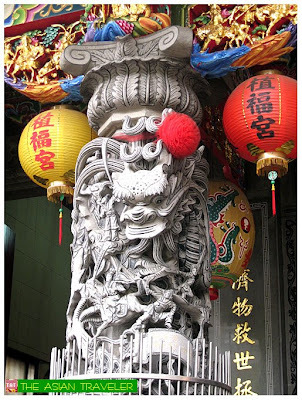 I guess we were simply brought there to get acquainted with Taiwan's rich religious heritage / folk religion and to observe a quintessential temple experience. Nevertheless, I just contented myself doing a few clicks whatever it was that captured my attention. 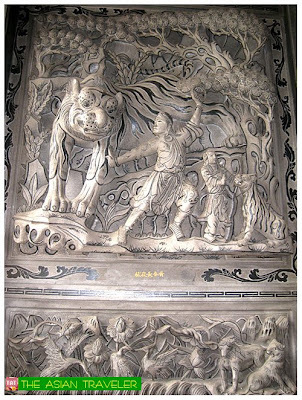 The place was simple but upon closer inspection, I noticed the highly ornate colorful roof decorations with gracefully curved eaves, the intricate carvings of dragon and warriors on columns, and some exquisite sculptures. 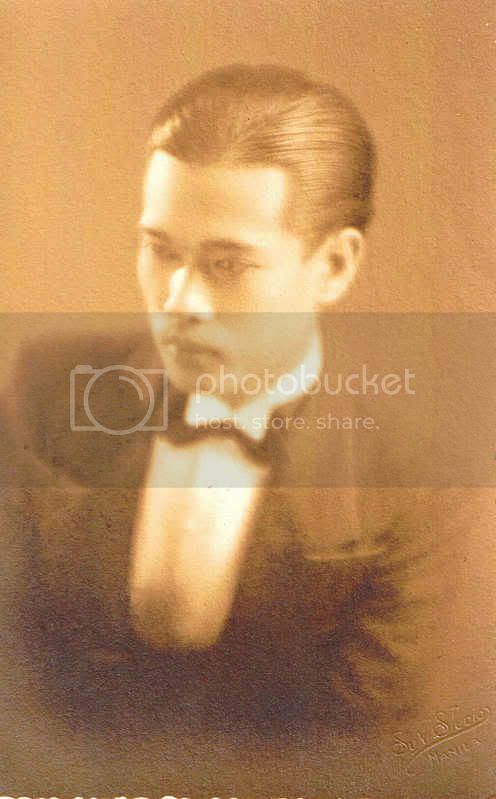 As we stepped through the door, there was only a caretaker - an old Chinese man. I just gave him a nod and my ever-ready smile. Soon our tour guide provided us some basic information about the beliefs and regular activities of the temple such as the divinatory practices. We also had a brief glimpsed of the elaborate decorative pieces. 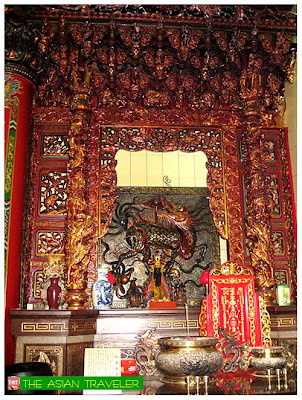 One interesting to note are the altars designed each with highly crafted large dragons frames on the wall and some statuettes of the gods and goddesses. thanks for sharing these photos. i've always been fascinated by Buddhist temples---the architecture, smells, colors, details, all so rich and different from what we're used to. Beautiful photos of the temple. I too hate visiting designated shops where they tried to pressurized you into buying...lol. Prefer to shop on our own. I don't know why our tour guide brought us here. 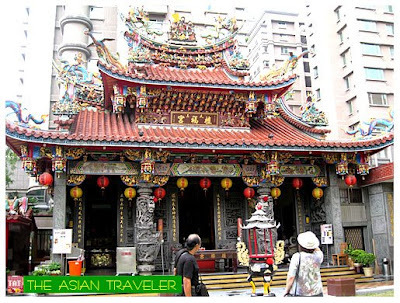 But Taipei also has big temples like the Lungshan Temple, one of the most famous and oldest places of worship. The temple is really small. In fact, it is the smallest temple I've seen. the details is amazing. im really stunned every time i see those temples. im really curious how they made it. how long it took them to finish that. Wow, am sure you had a good time traveling to these lovely places. 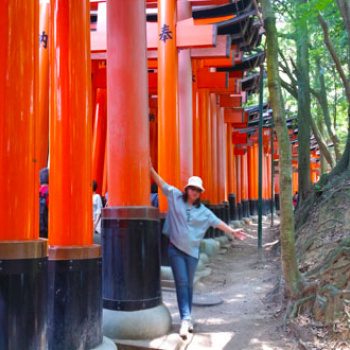 I love to travel too, however, that is if time permits, and children too. ;-) Sure, i'd love to ex links with you. I thoroughly enjoyed this travelogue and with amazing photography. I envy your endless travels and sightseeing! thanks for sharing those photos. the temple looks small but still colourful. HI! thanks for those kind words you left in my site, and yeah sure.. i've linked you up as well. this is so festive... very beautiful.